Player 1 plays crisp pass to player 2 and sprints up awaiting pass. Player 2 plays first time pass to player 1 and sprints to player 1 start position. Player 1 makes pass to player three and continues run. Player three makes first time pass to player 1 and sprints to player 2 start position. Player 1 makes pass to player 4 who makes 1 time return pass to player 1 and sprints to Player 3 start position. Player 1 after taking return pass from player 4 dribbles to cone and plays long pass down to player 2 (Now standing at the player one start position. 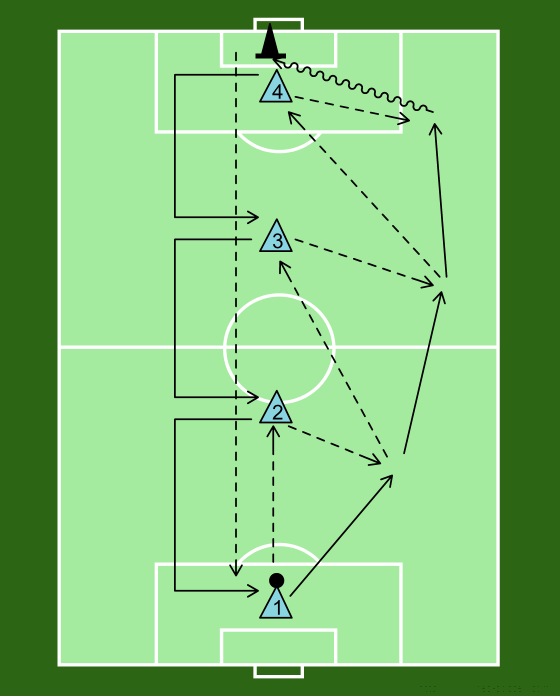 Drill is repeated until all players have made the run.